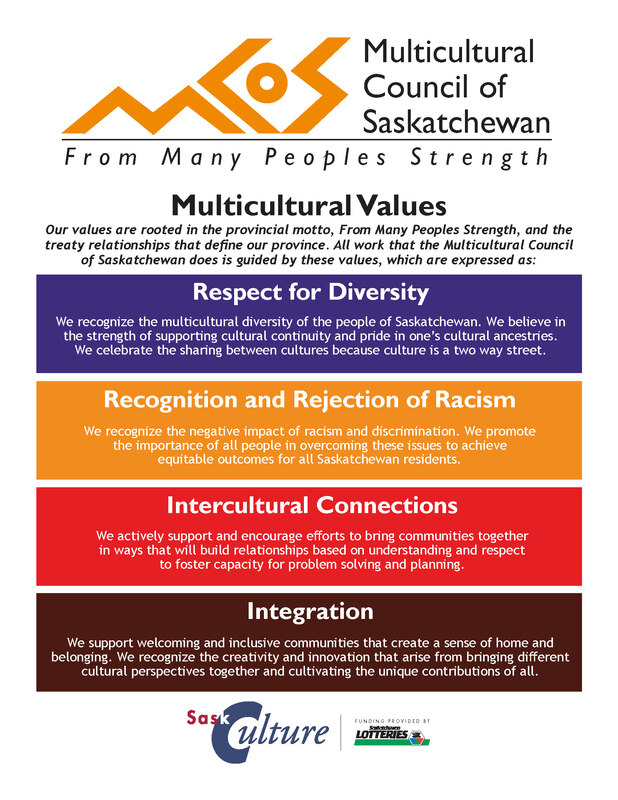 We recognize the multicultural diversity of the people of Saskatchewan. We believe in the strength of supporting cultural continuity and pride in one’s cultural ancestries. We celebrate the sharing between cultures because culture is a two way street. We recognize the negative impact of racism and discrimination. We promote the importance of all people in overcoming these issues to achieve equitable outcomes for all Saskatchewan residents. We actively support and encourage efforts to bring communities together in ways that will build relationships based on understanding and respect to foster capacity for problem solving and planning. We support welcoming and inclusive communities that create a sense of home and belonging. We recognize the creativity and innovation that arise from bringing different cultural perspectives together and cultivating the unique contributions of all. The multicultural streams flow from the multicultural values. 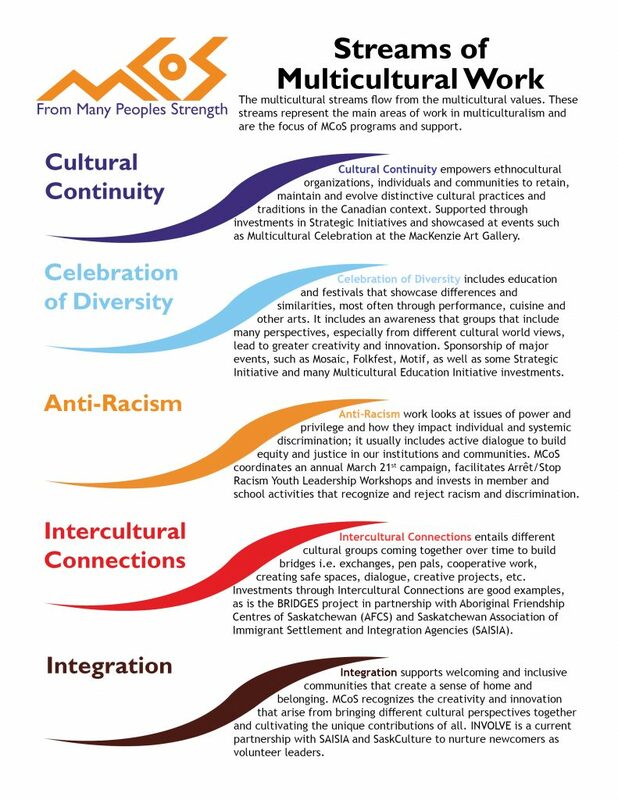 These streams represent the main areas of work in multiculturalism and are the focus of MCoS programs and support. Empowers ethnocultural organizations, individuals and communities to retain, maintain and evolve distinctive cultural practices and traditions in the Canadian context. Supported through investments in Strategic Initiatives and showcased at events such as Multicultural Celebration at the MacKenzie Art Gallery. Includes education and festivals that showcase differences and similarities, most often through performance, cuisine and other arts. It includes an awareness that groups that include many perspectives, especially from different cultural world views, lead to greater creativity and innovation. 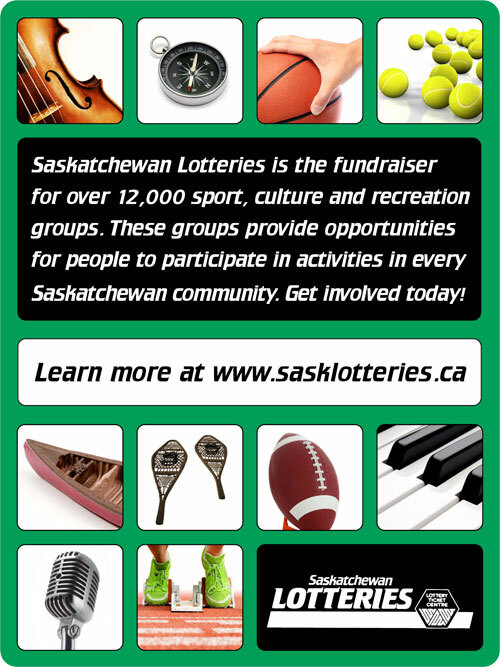 Sponsorship of major events such as Mosaic, Folkfest, Motif, as well as some Strategic Initiative and many Multicultural Education Initiative investments. This work looks at issues of power and privilege and how they impact individual and systemic discrimination; it usually includes active dialogue to build equity and justice in our institutions and communities. 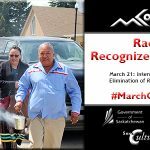 MCoS coordinates an annual March 21st campaign, facilitates Arrêt/Stop Racism Youth Leadership Workshops and invests in member and school activities that recognize and reject racism and discrimination. Entails different cultural groups coming together over time to build bridges i.e. exchanges, pen pals, cooperative work, creating safe spaces, dialogue, creative projects, etc. 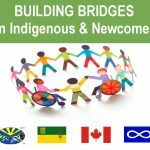 Investments through Intercultural Connections are good examples, as is the BRIDGES project in partnership with Aboriginal Friendship Centres of Saskatchewan (AFCS) and Saskatchewan Association of Immigrant Settlement and Integration Agencies (SAISIA). Supports welcoming and inclusive communities that create a sense of home and belonging. 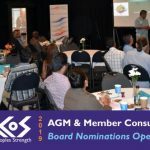 MCoS recognizes the creativity and innovation that arise from bringing different cultural perspectives together and cultivating the unique contributions of all. INVOLVE is a current partnership with SAISIA and SaskCulture to nurture newcomers as volunteer leaders.